Out of Office Email reply messages are common for business email, and are mainly used to notify the sender that the recipient is away from the office on vacation. Because email clients like Windows Live Mail aren’t always connected to the Internet Out of office messages are generally implemented at the email server. This is covered in detail by Microsoft here. What is important to realise is this functionality relies on Outlook being connected to an Exchange email server. The functionality is implemented on the exchange server but you can enable/disable and configure it from the client (outlook). If you aren’t using an exchange server email account with outlook then you can’t use this method. Yahoo Mail,Gmail and Outlook.com all support automatic out of office replies. To enable them you need to login to your email account using the web browser. 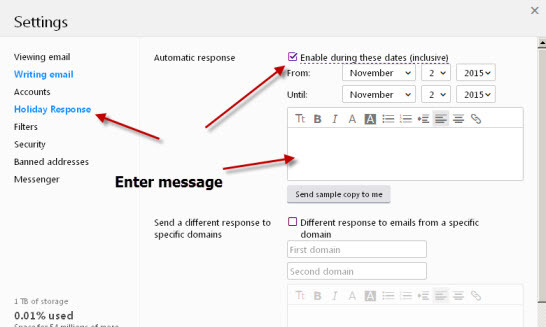 Enable out of office responses and set the dates that the response will be active then enter your response text in the message box. You can send a test response to yourself to see what it look like. You can also set different responses depending on the sender domain. If you enter the domain names (2 maximum) and then enter auto response text in the text box below then Email from these two domains will get the alternative holiday response. This is useful as you can send more open messages to trusted domains and less open to untrusted domains. Although auto replies might seem rather cool they do represent a security issue and you should use them cautiously. You should consider using separate messages for trusted and untrusted senders. Thank you for your email. I will be out of the office from [DATE] until [RETURN DATE] and will not have access to my emails. If you need assistance please contact [Alternative contact email] or you can in emergencies reach me on [PHONE NUMBER]. Thank you for your email. I an currently out of the office and will reply to your email as soon as I return. If you need assistance please contact [Alternative contact email– sales@domain.com] or you can in emergencies reach me on [PHONE NUMBER-Main sales number]. Gmail doesn’t support multiple responses but lets you restrict the out of office response to your contacts. From a professional viewpoint keep them plain and simple, and don’t try to be funny. Q- If I configure and Out of office reply will the mail still be delivered to my Mailbox? Q-My Email provider/systems doesn’t support out of office responses can I use a message rule on my email client? A- No not really as the rule and response requires that your client connects to the Email server to retrieve the email and then generate the auto response.